The best way to prevent (or at least significantly delay) these common asphalt problems is to have the asphalt installed correctly in the first place. The second way is to make sure regular maintenance and cleaning is performed and that the overlays and sealcoats are done properly and with the right materials by a professional. Third, but no less important is vigilance; always address small cracks or holes or asphalt swelling and patch failures early! We can fix these problems successfully with our custom cold mix asphalt, even in bad weather. The smaller the crack or hole, the easier it is to fix, and the more likely we are to prevent future damage from occurring. If the pothole is large, or the roadway is littered with them, entire sections of asphalt may have to be cut out and replaced, which is a lot more expensive. Some types of soil underneath the asphalt may react more drastically to temperature and moisture fluctuations than other types of underlying soil. Clay is one example. When it’s moist, it expands. When it’s dry, it shrinks down. When it freezes in cold weather, the ice will lift up the pavement, causing it to swell and bulge in places. When the ice melts back into water, it will fall again. But all of this activity is not good for the life of the asphalt. So if you notice asphalt swells like this, contact Espina Paving right away. Fixing swells usually involves removing sections of the pavement and altering the underlying soil or simply paving down with a new, full-depth patch. Patching damaged asphalt is a primary repair route for a lot of situations, particularly swells and potholes. But it is very important to make sure the patch is installed properly to make sure that it doesn’t cause more problems than it solves. Correct patch installation and using the correct materials can significantly minimize the toll that moisture, climatic fluctuations and heavy traffic have on a patch. If an existing patch shows cracking, or the surrounding, older asphalt is cracking and giving way, this is patch failure, and it’s important to act quickly. 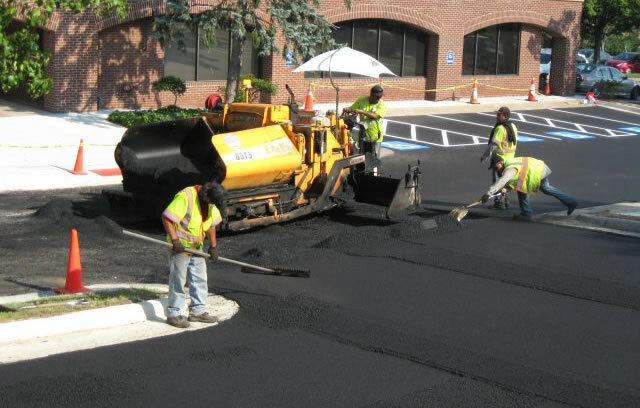 We can cut out the previous patch, smooth and treat the surrounding asphalt edges and dig down to full-depth or deeper to make sure that the new patch is solid, sturdy and will hold up to regular use without undue deterioration. Contact Espina Paving at 703-491-9100 right away any time you notice burgeoning cracks, potholes, pavement swelling or patch failures!